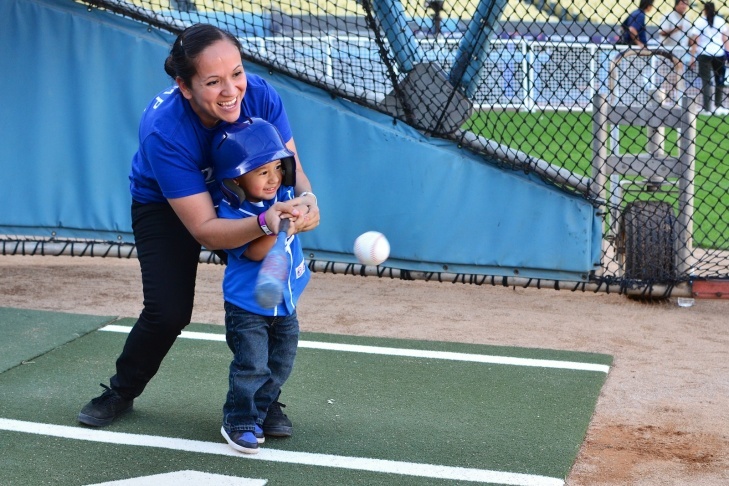 Veterans and their families and friends were invited to Dodgers Stadium for the Dodgers Veterans Day Batting Practice. 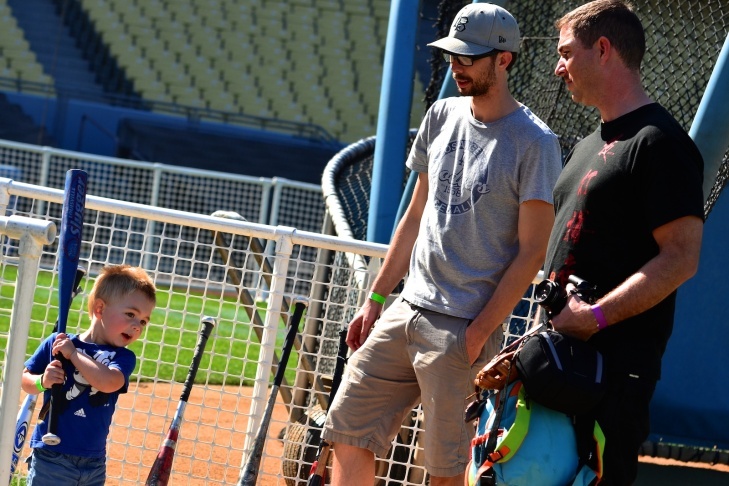 Nick Mendes, active duty Coast Guard, his son Owen and his brother Joel came out for the Dodgers Veterans Day Batting Practice. Jorden Miller-Root chases after the ball while playing catch with is father Sgt. 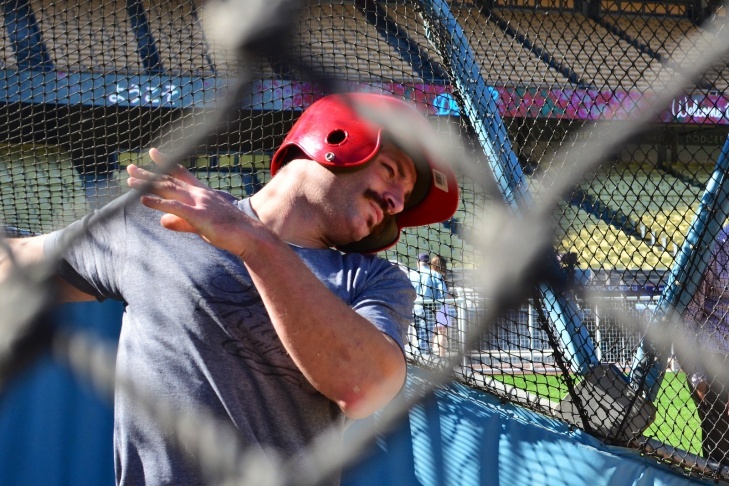 1st Christopher Miller-Root at the Dodgers Veterans Day Batting Practice. Army Reservist Sothy Kun gets pitching lessons from Roy Gleason. Active Navy Reservist Davis Sumida gets an autograph from Al Ferrara. 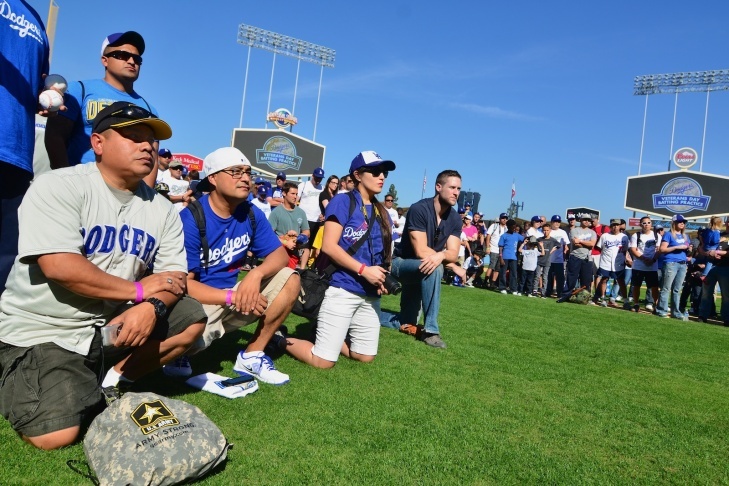 James Area come out with friends to the Dodgers Veterans Day Batting Practice. 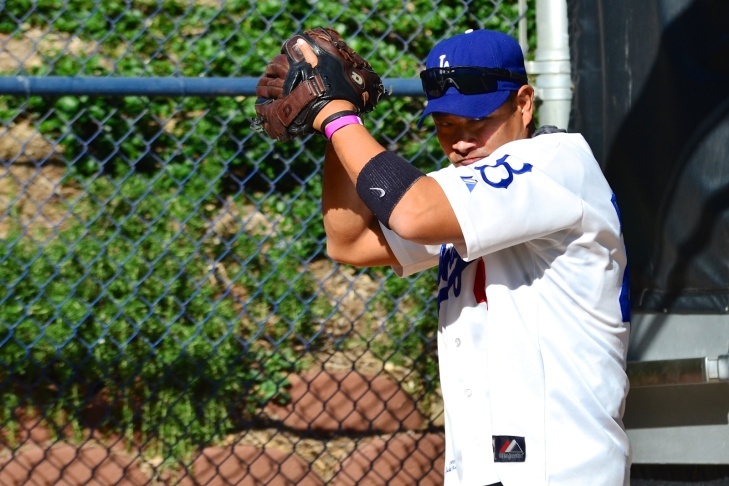 Atip Viskul practices his pitch at the Veterans Day batting practice at Dodgers Stadium, Viskul served with the Army and is now active with the National guard. 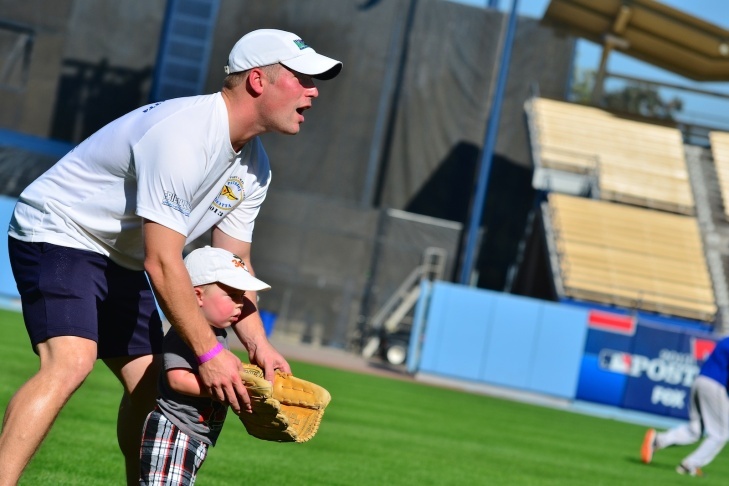 Active Coast Guard member Rob Hunter and his son Max in the outfield of Dodgers Stadium during the Verterans Day batting practice. 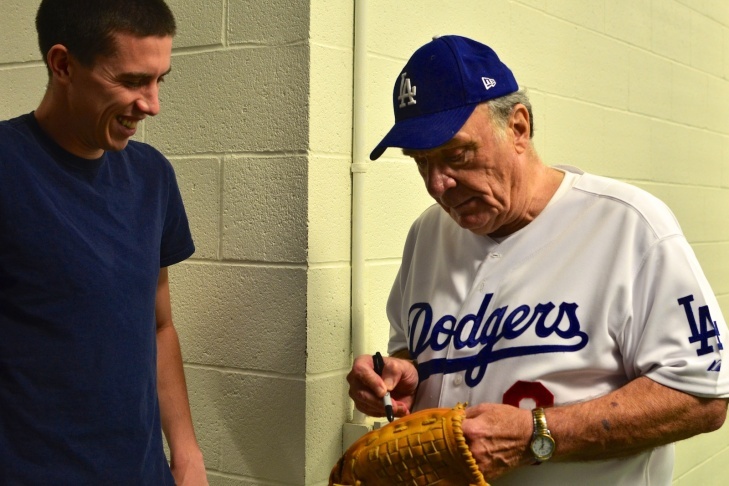 Air Force member Jason Murray gets a glove signed by Al Ferrara. Active Army Sgt. 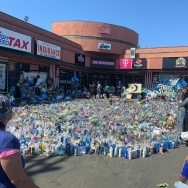 1st Class Joe Parra, US Air Force Staff Sgt. 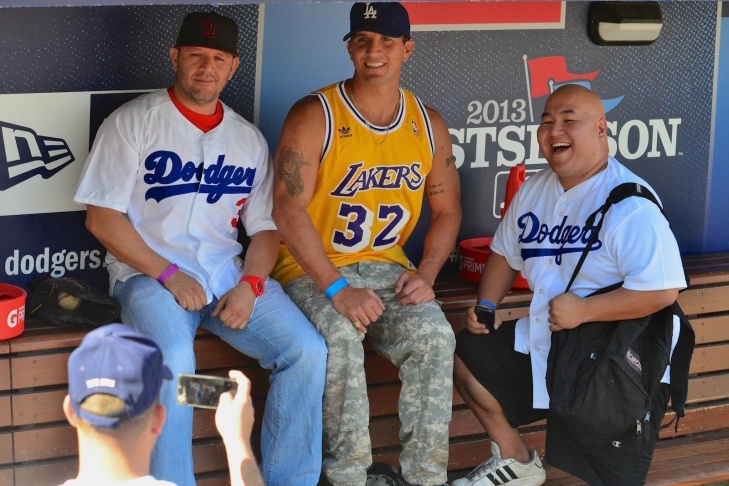 Matthew Parra and Steve Sueoka take a group picture in the Dodgers dugout. 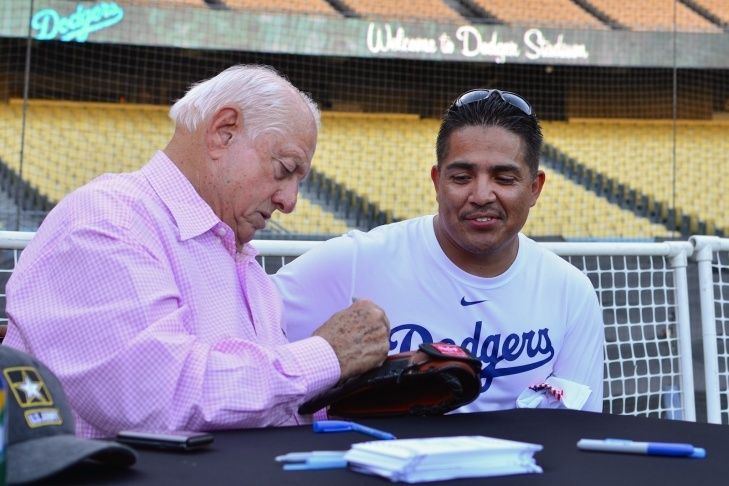 Miguel Alderete, active duty Navy, gets an autograph from longtime Dodgers manager Tommy Lasorda. 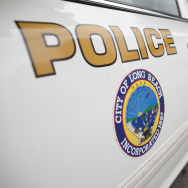 It’s no longer baseball season, but the Dodgers held batting practice on Monday. 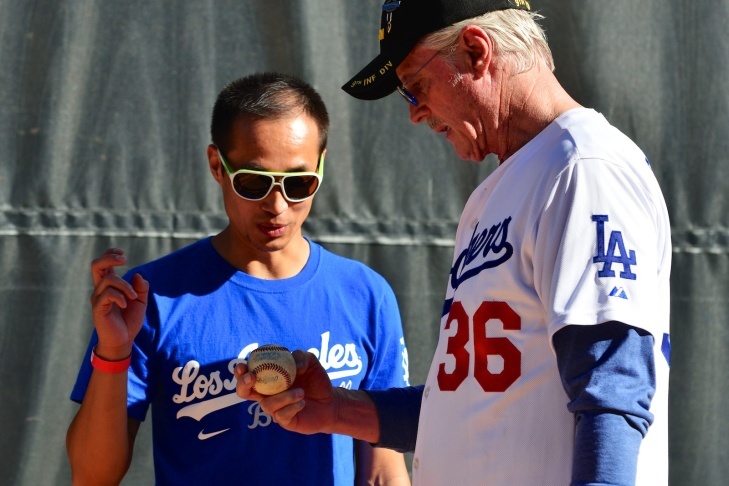 On Veterans Day the Dodgers hosted about 100 active and former U.S. military servicemen and women at Dodger Stadium for the batting practice. 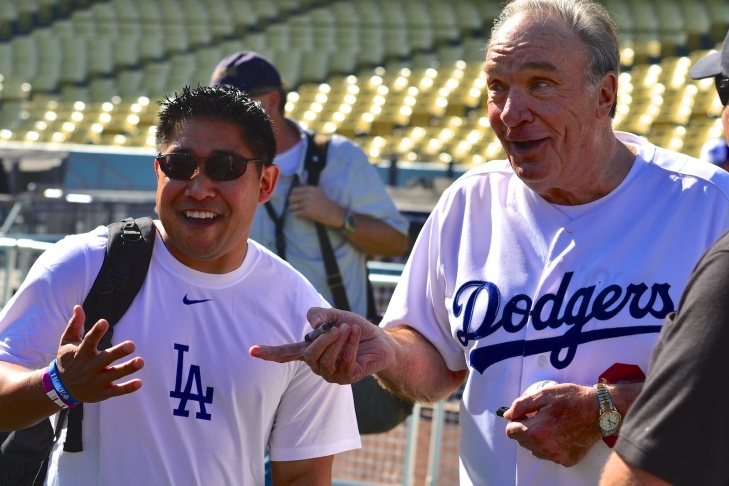 Former Dodgers Al Ferrara, Lou Johnson and Roy Gleason (an Army veteran and purple heart recipient) came out to give some batting and pitching pointers to veterans and their families. 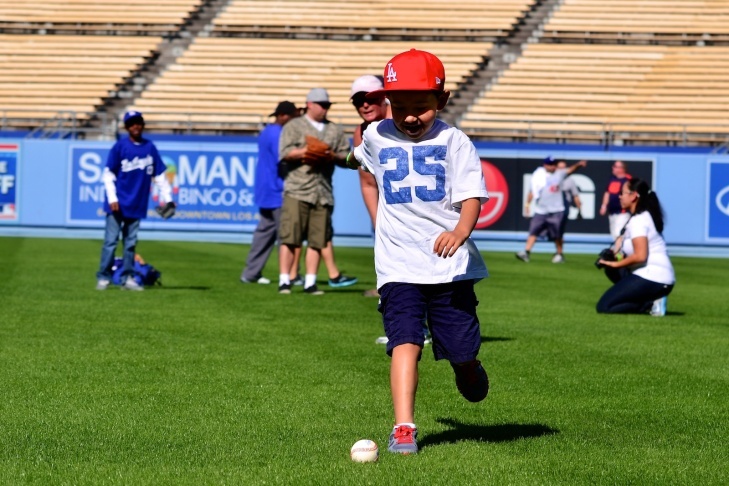 Veterans brought their kids to enjoy the day out on the Dodgers’ infield, playing catch and meeting famous Dodgers like Manager Tommy Lasorda. Lieutenant Colonel Steven Cole, a righty, was one of those veterans. Cole has been in the Army for 8 years, and was deployed to Afghanistan. 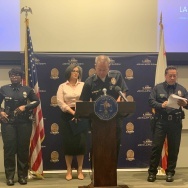 He told KPCC's Nick Roman Sunday that the annual event come out of the team's close relationship with veterans. 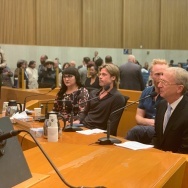 You can hear the full audio of Cole's interview at right.